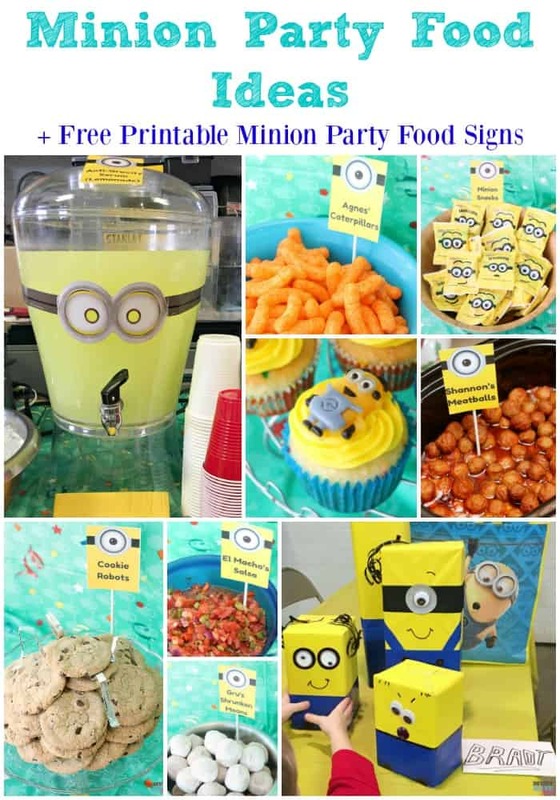 Are you planning a minion Birthday party? 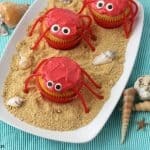 I have a bunch of really EASY and FUN minion Birthday party food ideas for you and I’ve upped the ante and I’m giving away my cute minion food signs I created too!! Read on for the best ideas and grab the free printable! My son Brady just turned 3 and he is obsessed with minions so we went all out with minions everywhere for his Birthday party! 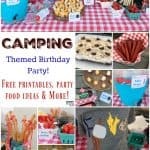 I have really EASY and FUN minion Birthday party food ideas and tomorrow I’ll also show you how to create some adorable minion wrapped gifts and share some of our favorite minion themed gift ideas too! Remember when Gru sent in the cookie robots to spy on his nemesis and steal the shrink ray? 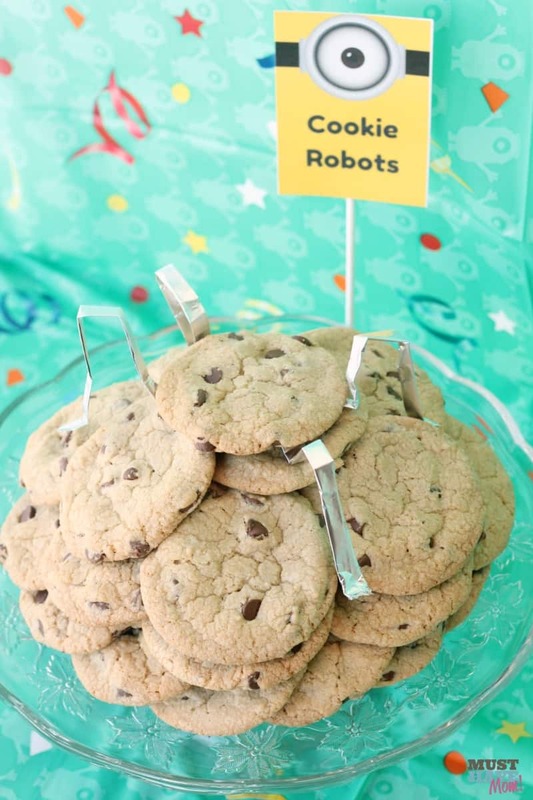 These chocolate chip cookie robots were perfect for our minion birthday party themed food ideas! Add four tin foil “legs” and they even look like robots! Need a slammin’ chocolate chip cookie recipe? Grab my favorite one here. 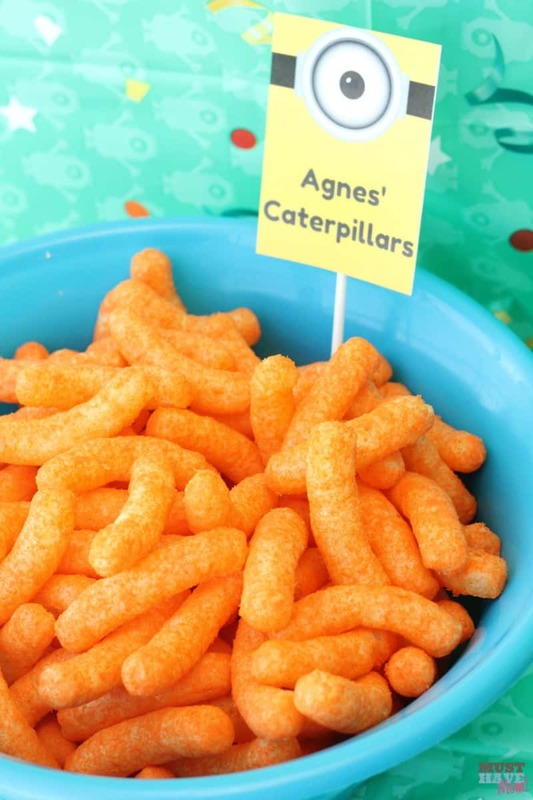 Is it a caterpillar or a Cheeto? Hmmm…just ask Agnes! 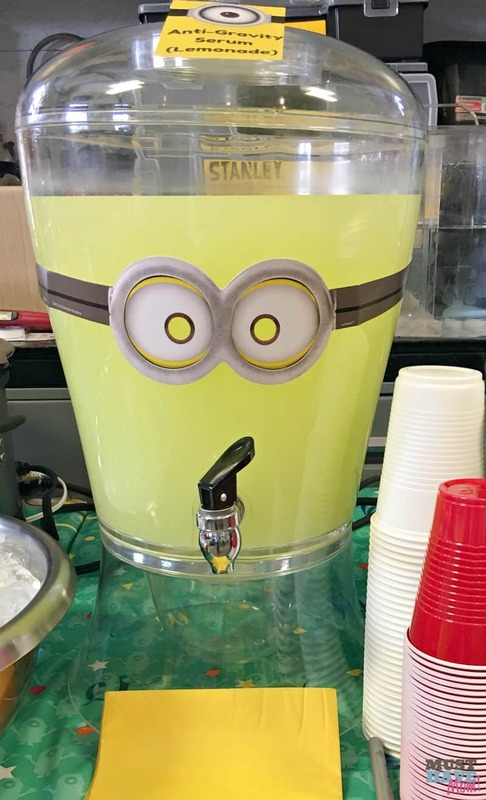 I dressed up my lemonade dispenser with a pair of these minion goggles and it looked SO adorable and just like a minion! Just make some lemonade and add the goggles. The rest of the googles can be used for the kids at the party! For our protein element in our menu we went with turkey sweet and sour meatballs (grab the sweet and sour meatballs recipe here and sub turkey meatballs for the beef if desired). 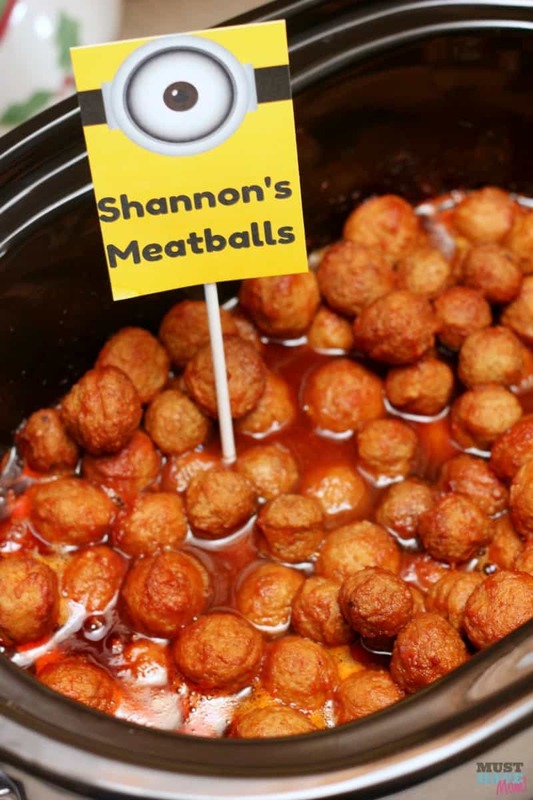 Keeping with the minion birthday party food ideas we called these “Shannon’s Meatballs”. Remember Gru’s date with Shannon? She was eating meatballs!! These were a huge hit at the party and every last one was gone by the end of the party. We all know El Macho and his evil plans! 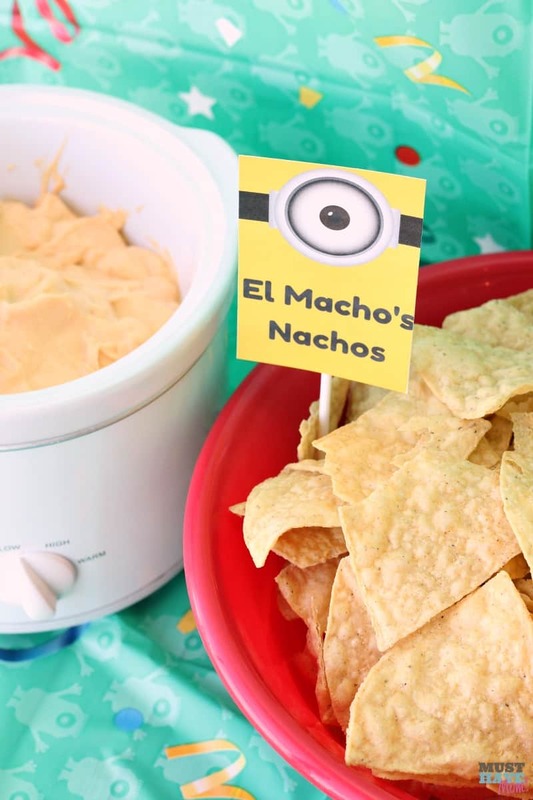 His love for Mexican food translates nicely into our minion birthday party food ideas with El Macho’s Nachos! I heated the nacho cheese in a mini slow cooker and served jalapenos on the side along with tortilla chips. 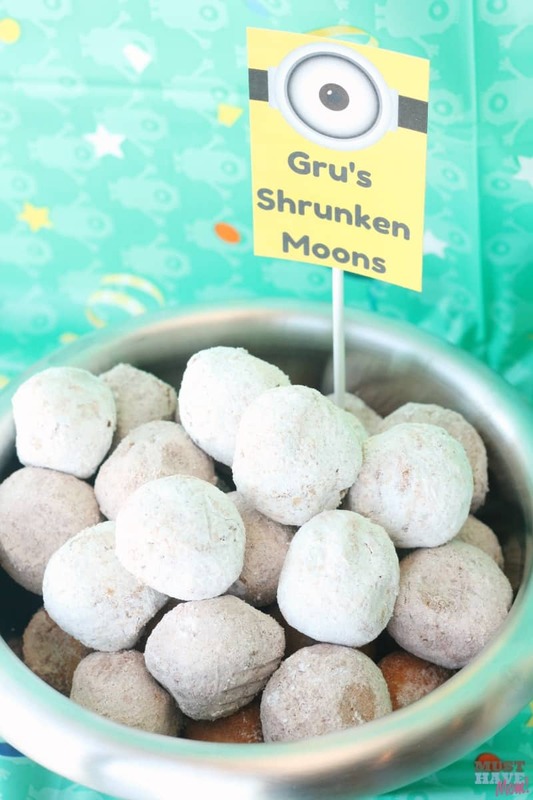 Gru was famous for shrinking the moon (and then giving it back) so we celebrated with Gru’s shrunken moons a.k.a. powdered donut holes! 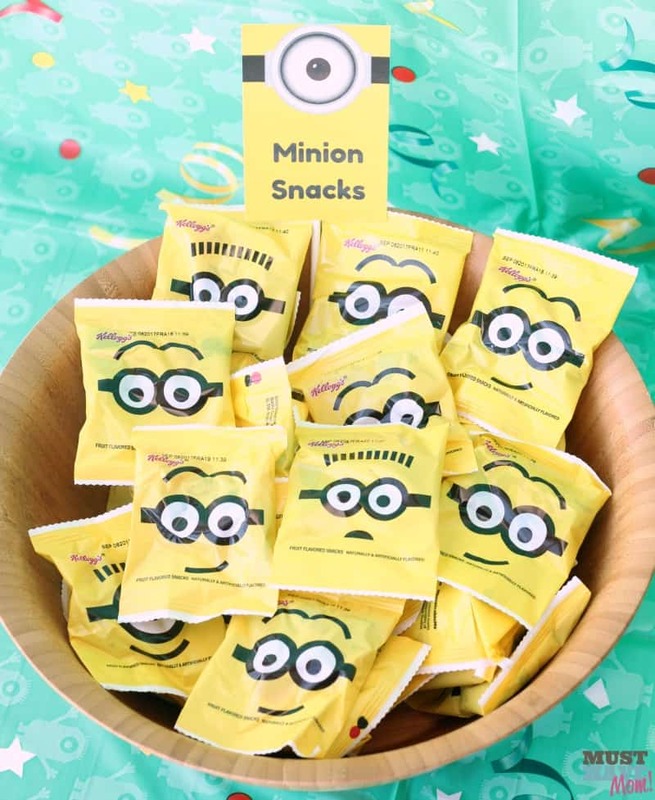 These minion fruit snacks were just perfect for our minion birthday party food ideas!! We couldn’t resist one more nod to El Macho with my homemade salsa! 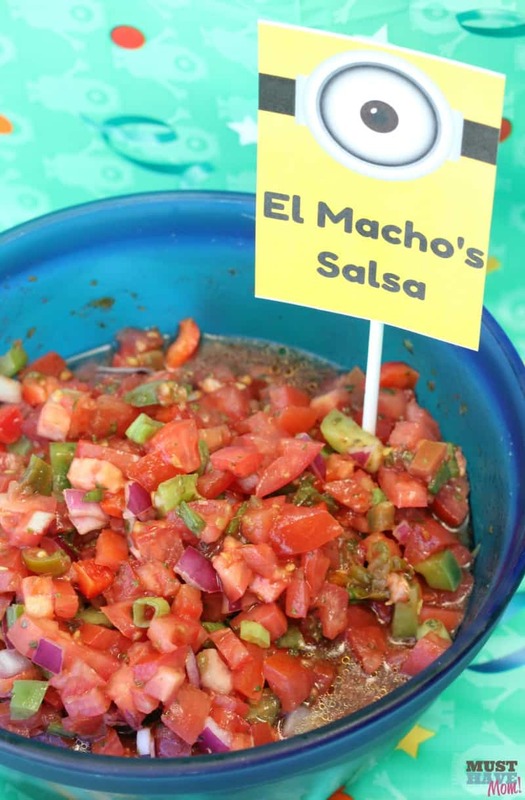 El Macho’s salsa can be store bought or homemade! Need a recipe? Here’s my favorite salsa recipe. I started with high hopes for some hand-decorated minion cupcakes and they were an epic fail. 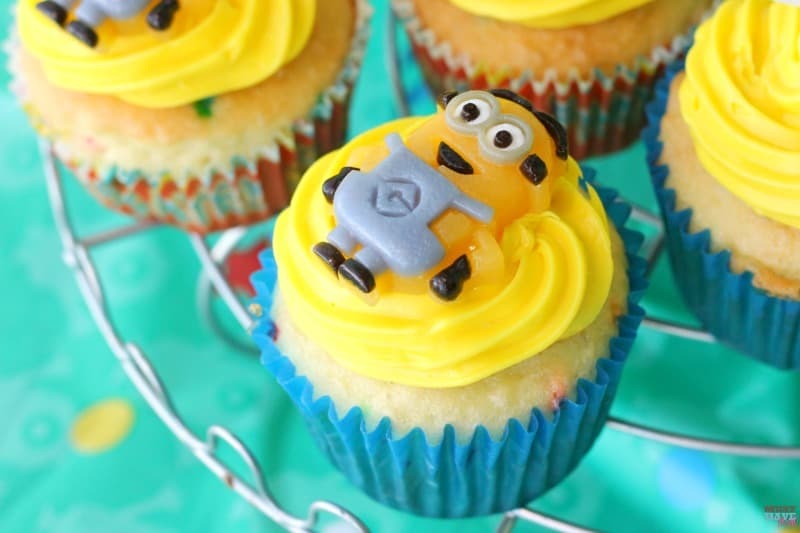 I redeemed myself with these SUPER EASY minion cupcakes. I used these minion gummy cupcake decorations (I found these at Walmart near the Wilton baking supplies) and minion cupcake wrappers. I paired the minion cupcake wrappers with plain blue wrappers to give it some color variation. I used a bright yellow frosting (this one) and piped it on with my dessert decorator. I also used minion cupcake picks on some of the cupcakes. They turned out really cute! I arranged them on my cupcake stand and set them out when it was time to sing Happy Birthday. My stepmother brought her gifts wrapped as minions! They were so adorable! 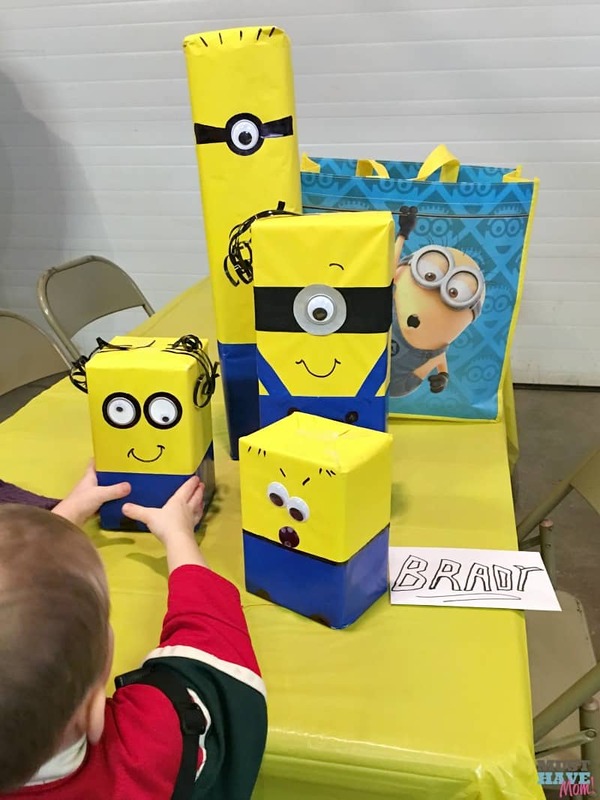 See my DIY Minion Gift Wrap post to learn how to wrap any box to look like a minion. 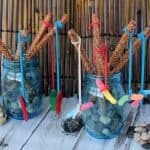 This could also serve as an inexpensive centerpiece idea! 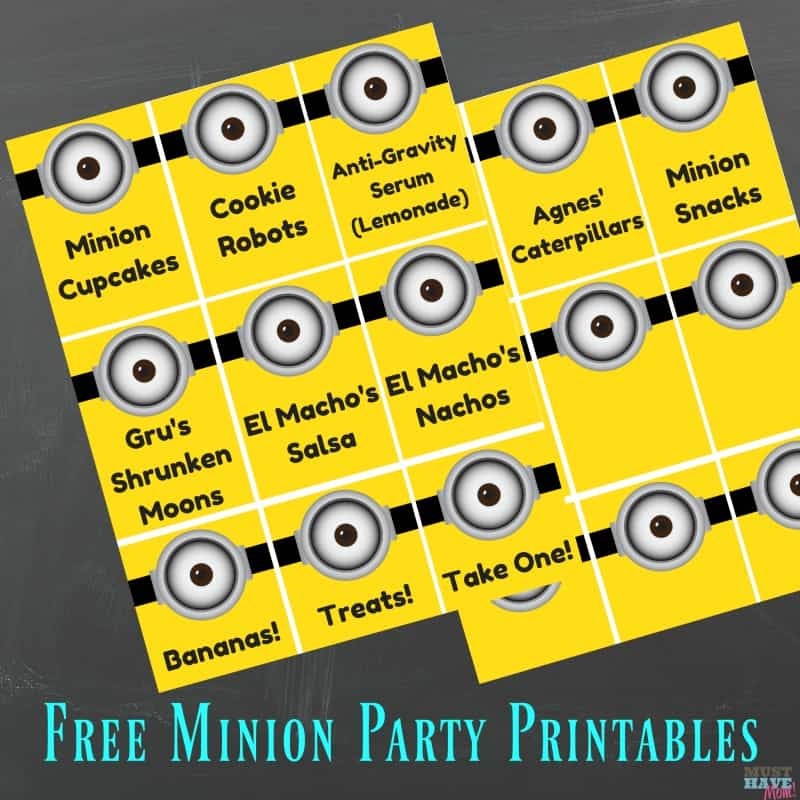 Go print off your free Minion Birthday party printables here! There are food signs for each of the minion themed food ideas I shared here as well as blank signs to make your own! I also included a “Take One!” sign for party favors. I recommend printing these on index paper so they are sturdier. I printed them, cut them apart with my paper cutter and then taped them onto lollipop sticks and stuck them into the food or taped them to the serving dish. Need minion gift ideas? I have a list of 31 minion gift ideas that are perfect for little minion loving kiddos! 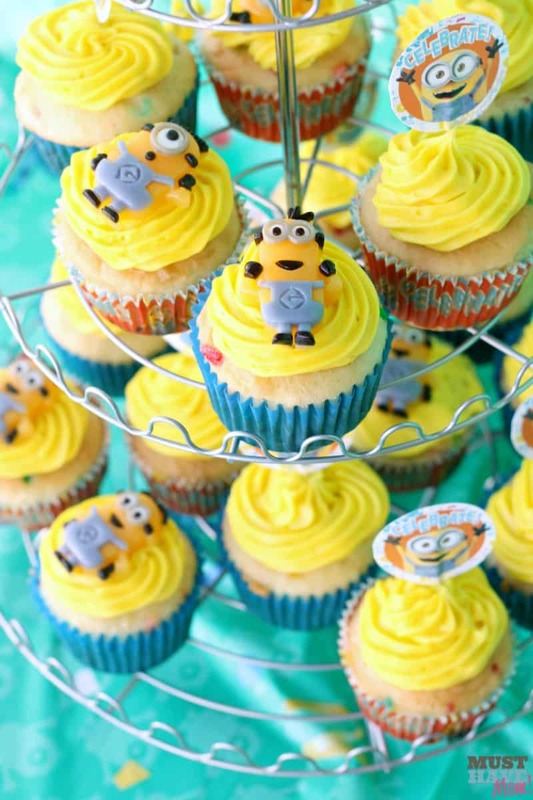 If you have a minion themed birthday party I’d love to see your photos! Share them with me on the Must Have Mom Facebook page! Great ideas. I like the cupcakes best. 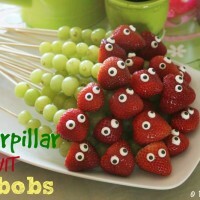 Oh my gosh, these are super cute ideas. Thanks for sharing.